So I copped out slightly on this challenge however I have good reason, today I received nail mail from one of my amazing Brazilian nail fairy. One of the awesome things I got was the new MTV polishes by HITS. I mean there is a music connection. I just had to try out Pink Pop first and decided to try a jelly sandwich manicure. I used two coats of Essie Marshmellow and then one coat of Pink Pop which is a clear base with Silver, Pink and Red multi-glitter and then one more coat of Essie. 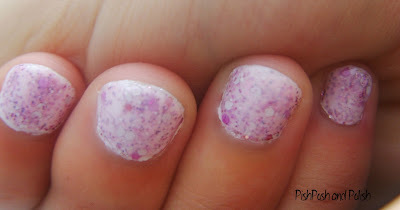 I love sandwich manicure's they have such a great depth and texture to them. This combination reminds me of Raspberry Ripple Icecream- Yummy! I love the addition of red glitter in the mix as it is nothing like any other glitter I own. Also you can see in the close up shots that the silver glitter has turned white under the Essie. I guess the closest I have to this is Lynnderella Matter of the Heart even though really they are nothing alike. Don't forget to check out the others ladies music inspired manicures! The glitters are so pretty . Lovely mani.